Start off your visit on the 24th (Sun): stroll through Saariselka Ski & Sport Resort. To find reviews, ratings, photos, and other tourist information, refer to the Saariselka online sightseeing planner . Bayeux, France to Saariselka is an approximately 20-hour flight. You can also drive. Traveling from Bayeux to Saariselka, you'll lose 1 hour due to the time zone difference. Prepare for cooler weather when traveling from Bayeux in March: high temperatures in Saariselka hover around -1°C and lows are around -12°C. 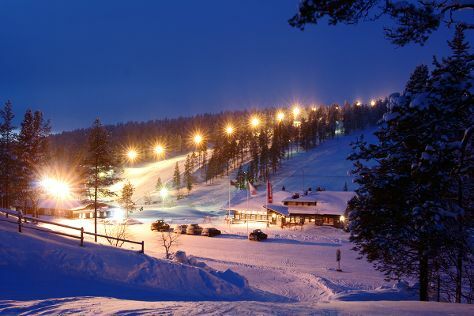 Wrap up your sightseeing on the 24th (Sun) to allow time to travel to Levi. Kick off your visit on the 25th (Mon): experience rural life at Santa"s Cottage & Pet Farm, don't miss a visit to LUVATTUMAA - Levi Ice Gallery, then surround yourself with nature on a nature and wildlife tour, and finally have some family-friendly fun at Kid's Land. Get ready for a full day of sightseeing on the 26th (Tue): don't miss a visit to Giewont Husky Adventures, then explore and take pictures at Ice Karting Levi, and then gear up at Elan Ski Shop & Rental. To see traveler tips, photos, where to stay, and more tourist information, use the Levi tour itinerary planner . Traveling by combination of bus and flight from Saariselka to Levi takes 3 hours. Alternatively, you can drive; or take a bus. Expect a daytime high around 0°C in March, and nighttime lows around -10°C. Cap off your sightseeing on the 26th (Tue) early enough to go by car to Akaslompolo. Kick off your visit on the 27th (Wed): get outside with Scandinavian Adventures and then take an exotic tour of a safari tour. To see photos, ratings, and tourist information, refer to the Akaslompolo trip builder site . Traveling by car from Levi to Akaslompolo takes 1.5 hours. Alternatively, you can take a bus. In March, daily temperatures in Akaslompolo can reach 0°C, while at night they dip to -10°C. Wrap up your sightseeing on the 27th (Wed) to allow time to drive to Kemi. Kemi is a town and municipality of Finland. Kick off your visit on the 28th (Thu): admire the masterpieces at Kemin Jalokivigalleria (Kemi Gemstone Gallery), then admire the striking features of Kemi Church, and then take in the architecture and atmosphere at Tornio Church. To find reviews, more things to do, where to stay, and tourist information, use the Kemi driving holiday planner . Getting from Akaslompolo to Kemi by car takes about 3.5 hours. Other options: take a bus; or take a train. In March, daytime highs in Kemi are 0°C, while nighttime lows are -10°C. Wrap up your sightseeing on the 28th (Thu) to allow time to take a train to Rovaniemi. Start off your visit on the 29th (Fri): tour the pleasant surroundings at Ounasvaaran Hiihtokeskus Oy, then pause for some serene contemplation at Rovaniemi Church, then engage your brain at Pilke Science Centre, and finally stop by Your Piece Of Finland. To see where to stay, maps, more things to do, and other tourist information, read Rovaniemi itinerary maker site . Getting from Kemi to Rovaniemi by train takes about 1.5 hours. Other options: take a bus; or drive. In March in Rovaniemi, expect temperatures between -1°C during the day and -9°C at night. Wrap up your sightseeing by early afternoon on the 30th (Sat) to allow time for travel back home.